Signatory Vintage is a Perthshire based independent bottler and owner of the Edradour distillery in Pitlochry. They have a vigorous release policy and their ranges include a cask strength collection, an un-chill filtered collection and a single grain collection. Glenrothes distillery was founded in the heart of the Speyside region in 1878. It is owned by the Edrington Group, who also own The Famous Grouse, The Macallan, Cutty Sark amongst others. 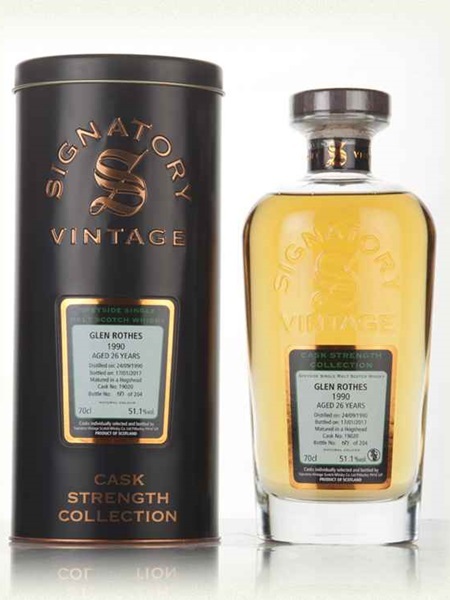 This Glenrothes single malt, part of the cask strength collection, was distilled in September 1990 and bottled in May 2017. It has been matured in a hogshead cask and bottled at 48.9% ABV.